Grandma's old fashioned strawberry pie recipes cannot be compared with today's. You'll love the delicious summery taste of these fruit pies. They are so easy to make yet they taste so delicious. Just imagine the fresh, fruity taste of plump, red strawberries encased in a rich, flaky pie crust. 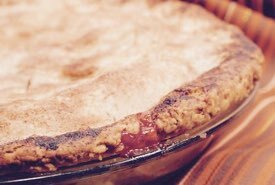 You simply must try one of these vintage pies and enjoy the taste of summer. 1 unbaked pie crust, 1 quart fresh strawberries, 3 eggs, separated, 1/2 cup sugar, 1/2 cup flour, whipped cream. Line a pie plate with rich pastry and fill with strawberries. Beat the egg yolks well, add sugar slowly, and beat until mixture is fluffy. Add flour and continue beating. Fold in beaten egg whites last, and pour mixture over strawberries. Bake in a hot oven (375°F) for 8 minutes. Reduce heat to 325°F and bake slowly until pastry is done. Serve hot with lots of whipped cream. It makes a refreshing change from the usual cold fare. The old fashioned strawberry pie recipes always turn out best when made with fresh-picked strawberries. But, if you cannot obtain fresh berries, the frozen or canned variety may be used in a pinch, and the pie will still taste very good. For an amazing taste treat, serve your homemade pie with homemade vanilla ice cream! The wild strawberry Fragaria virginiana is found growing throughout North America and is one of the species that gave rise to the popular garden strawberry we enjoy today. You'll find it thriving naturally in woodland clearings, grassy meadows, alongside pathways, and in the ditches of country roads. 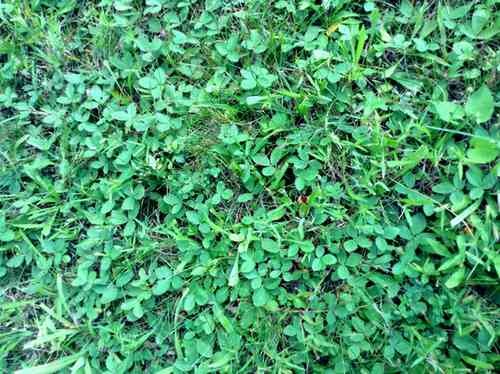 You might even find it growing in your lawn. 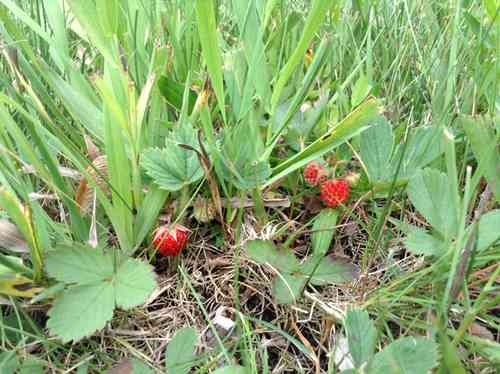 Below, a patch of wild strawberry plants can be seen growing in the lawn that surrounds our Ontario home. We purposely don't treat our lawn with weed sprays or chemical fertilizers or anything that would harm or poison the tiny strawberry plants. We set our lawnmower's cutting height at 3 inches and allow the grass to grow longer during the June berry season so the berries can ripen. 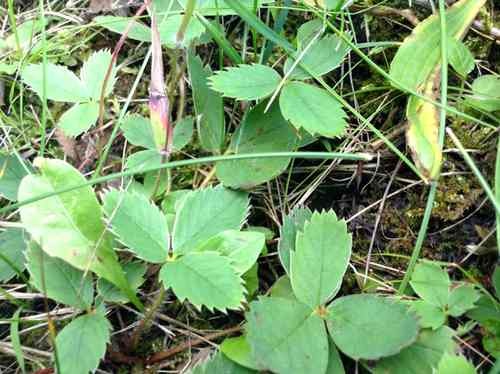 The wild strawberries are much smaller; it takes about 15 or more to equal one of the large hybridized varieties, but the wild fruit tends to be sweeter and tastier in comparison. 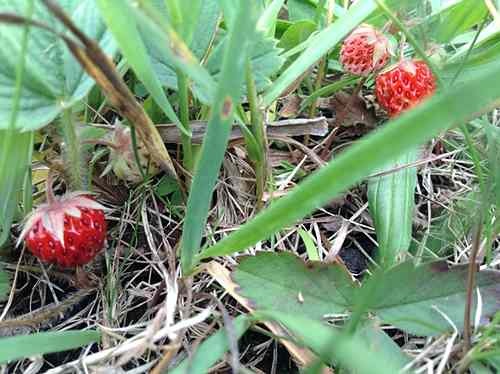 The tiny strawberries ripen very quickly to a bright red color, and you'll need patience to harvest them. Be prepared to take what seems like ages to collect just a handful or two. 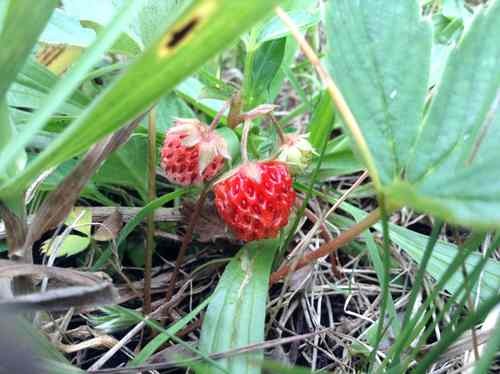 At age 103, my Aunt Jessie could still recall picking wild strawberries as a child. She and her siblings would gather tinfuls of the tiny red berries for Grannie Bell to make delicious homemade tarts or jam. Very gently wash the berries, then remove their tiny caps. Pour the fruit and sugar into a bowl and allow to sit for 12 minutes, turning several times with a spoon. Cut a half dozen pastry shells just a bit larger than your tart molds, then line the buttered molds with the dough. Prick the bottoms of the tart shells with a fork, crimp, or trim the edges, then fill with the wild strawberry mixture. Oven bake at 375°F for 20 minutes, or until done. Allow to cool and enjoy an old fashioned delicacy! This strawberry dessert pie was once enjoyed at President William Howard Taft's summer lawn parties at the White House. Enjoy using the same old fashioned strawberry pie recipe that was used by the White House chefs. 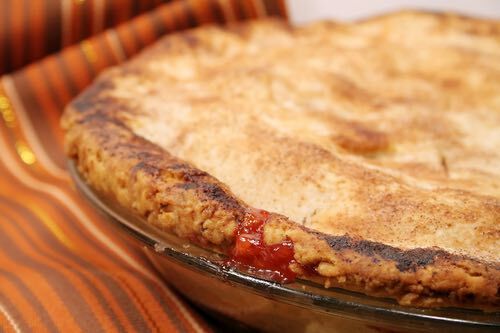 After picking over the berries carefully, arrange them in layers in a deep pie plate lined with puff paste, sprinkling sugar thickly between each layer; fill the pie plate pretty full, pouring in a quantity of the juice; cover with a thick crust, with a slit in the top and bake. Take a small cupful of the cream from the top of the morning's milk, heat it until it comes to a boil, then stir into it the whites of two eggs beaten light, also a tablespoonful of white sugar and a teaspoonful of cornstarch wet in cold milk. Boil all together a few moments until quite smooth; set it aside and when cool pour it into the pie through the slit in the crust. Serve it cold with powdered sugar sifted over it. Raspberry, blackberry, and whortle berry pies may be made the same. Strawberries are known in most parts of the world, particularly in Europe and North America, and few other fruits can compare with the strawberry in point of flavor. A member of the rose family, its name is said to be derived from an age-old custom of putting straw beneath the berries when they began to ripen, which helps to keep them moist and clean for picking. This tasty red fruit has made traditional strawberry pie recipes popular with home cooks for centuries.